Sesame Street's Big Bird leads American and Chinese children in an adventure exploring the night sky through an engaging planetarium show that premiered in Beijing September 26, 2008, and premiered in Chicago, Ill., on October 15. 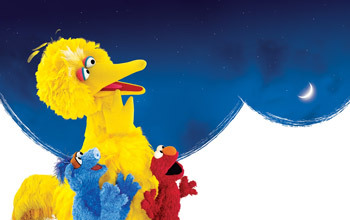 With major funding from the National Science Foundation, "One World, One Sky: Big Bird's Adventure" brings the wonder of astronomy to young children through a collaboration between Sesame Workshop (the nonprofit educational organization behind Sesame Street), the Beijing Planetarium, the Adler Planetarium in Chicago and the Liberty Science Center in Jersey City, N.J. The project includes educational outreach materials for children ages four to six and their families, teachers and caregivers. The planetarium show will appear in English and Spanish in the U.S., and in Mandarin in China. Among its goals are to promote positive attitudes toward science among children in each country, and to foster cross-cultural appreciation between children. Visit the "One World, One Sky: Big Bird's Adventure" Web site at http://www.sesameworkshop.org/initiatives/respect/sky. Credit: © 2008 Sesame Workshop. All Rights Reserved. Photos by Richard Termine.